In the summer of 1974, a live grenade was accidentally included in a box of dummy ammunition used at a safety lecture for army cadets at CFB Valcartier. One of the boys pulled the pin and the grenade exploded, killing six cadets and injuring 54 more of the 138 boys present. Gerry Fostaty was 18 years old, an NCO, at the time. This book is his memoir of the event and of the days before and the years since.I first heard of this incident on CBC Radio. One of the boys, now in his 50's, was interviewed about what had happened. Unfortunately, I don't recall his name. What stayed with me was that he was at this summer training camp at a safety lecture, sitting cross-legged on the floor, when suddenly the boy sitting in the row in front of him disappeared, leaving small parts of his body all over this person, who was being interviewed on the radio over 30 years later. The man went on to describe how the boys -the ones who weren't rushed to hospital- were marched to the base chapel, isolated from the other cadets and unable to telephone home, interviewed about the incident in an inquiry, then sent home at the end of their summer camp with no counseling offered either to them or their families. They were all between 14 and 18 years old. The incident hardly made the papers at all.I knew after that radio interview that I wanted to read this book. I admit that I have a certain aversion to watching the news and am not well up on current events or even historical ones. But I felt this was a story I wanted to know more about. So I put this book on my to-read list and soon got it out of the library.The book is very well written. Gerry Fostaty writes in a voice that is both mature and vulnerable. His is the voice of a fifty-some year-old man speaking as an 18-year-old who is trying to deal with unbelievable events without much support from his superiors. That is not to say that the boys were completely abandoned. Gerry Fostaty was clearly grateful for Sergeant Gutta's presence and guidance. He also recalls the base chaplain, Padre Robert Baker, who had helped set the bunks up in the chapel for the exhausted boys and had walked among them, speaking kind words to each one. Fostaty walked into his office to find the chaplain snoring, asleep in his chair at his desk after a day that was about as exhausting for him as it was for the boys. Another kind gesture was by the camp CO Colonel Whitelaw, who set up a bed for himself in the barrack on the first night the boys returned to sleep there. It was assumed that some of them might be nervous sleeping where the explosion had taken place, so he came and wordlessly offered them moral support.Fostaty also is very talented at portraying the teenage boys who he spent six weeks at camp with. They were army cadets, youthful, more or less disciplined, full of bravado. One line that made me smile was when Fostaty had to wake a fellow NCO to take over from him for fire-picket duty. Fostaty tried to wake him quietly so as not to disturb the other, sleeping, cadets. The boy wouldn't wake so Fostaty gently kicked his mattress with is boot. The other boy, "with his eyes still closed, (...) managed a well-enunciated, 'Mange la merde. '"After recalling the events of that summer, Fostaty joins Sergeant Gutta -who asks him to just call him Charles- in finding the other cadets, who had all lost touch since then. They start an on-line group where they can catch up and try to organize a reunion. Fostaty and Charles discuss their frustrations with the administration at CFB Valcartier, who do not want to deal with the incident, stating that it was 30 years ago, it is part of the past. The book ends with Fostaty admitting to himself that he is suffering from post traumatic stress disorder (PTSD) and taking the necessary steps -long overdue- in getting help.I have always thought of myself as a pacifist and have not had much interest in the army. I was put off by the cover illustration of the book, showing young boys with rifles in their hands. I am glad I was able to get past the picture. This is a touching story, touchingly told. I am glad that I read it. A very well-written account of a little-known incident involving the Royal Canadian Army Cadets in 1974. A live grenade somehow ended up in a box of dummy ammunition during a lecture on explosives safety, killing six cadets and injuring 54. Despite the severity of the incident, it did not receive a great deal of media attention, and even within the Canadian Forces and DND (the Canadian Department of National Defence) there was a tendency to push the whole thing under the rug. Yet the fact remains that the survivors were deeply traumatized and received no help dealing with the aftermath.The book is well organized chronologically, starting in the present, then going back to the day of the explosion, which starts off with some routine matters to set the stage of life in a cadet camp, then the immediate aftermath, and eventually back to the present. Throughout, Fostaty draws on his own memories, using documentation he requested from DND to fill in the blanks. His writing style is conversational, able to tell a hilarious anecdote one chapter (involving a portrait of Queen Elizabeth II and the Paul McCartney song "Give Ireland Back to the Irish") then later on able to leave you breathless with shock and horror as he describes the chaos and carnage of the explosion. And you know that that's just the detail that made it to the page -- there's probably more that cannot be conveyed by mere words.Overall this is a worthy read, recommended for those interested in the history of the Canadian Forces and/or the cadets.This book came to my attention via Quill and Quire, as reported on CBC Books. Full review at http://www.perogiesandgyoza.com/2012/...In the summer of 1974, Fostaty was an NCO at the Valcartier cadet camp in Quebec, when on July 31, during a training session a real grenade was mixed in with the dummies. When the pin was pulled out, it exploded, leaving 6 boys dead and 54 wounded. He sets the scene of what it's like to be an army cadet, from the toothbrushes used to clean boots to the meals in the mess. The contents of the documents he received from the Department of National Defense under the Access to Information Act he explains clearly, setting the scene. The events of July 31, 1974 are described clearly and succinctly and it was so easy for me to see the mayhem through Fostaty's eyes. He includes the aftermath, up to the 35th anniversary where the survivors met for the first time since the incident. It's all extremely well-written, and so compelling I was unable to put the book down after thinking I would just read the first chapter before bed. That doesn't happen very often with nonfiction books! The strange and haunting story of the tragedy at the summer cadet camp in Valcartier, Quebec continues to plague the families whose men and boys were involved, 38 years after the events there took place. Imagine the indolence of deep Canadian summer in 1974, when 13- to 15-year-old boys gather at cadet camp to learn to discipline, obedience, and the manly arts. On a routine rainy day, while the boys are learning the dangers of unexploded ordnance by viewing dummy ammunition in a barrack, a live grenade detonated, killing or injuring 60.A mistake, a carelessness compounded again and again over a period of days, led the live grenade to be placed in a box of dummies. The instructor was not responsible for the disaster and indeed was himself injured in the explosion. A series of unfulfilled transfers from a live demonstration led a box of live ammunition and a box of dummies to be placed side-by-side in the back of the same truck.The lives of hundreds of people were directly or indirectly altered by events that day, and one cannot help but look with scalded eye at the army handling of the moment and the aftermath. The leadership of armies the world over are slowly becoming aware that their ranks are people, too, who can be as great or as lax as the organization that feeds them. But they can also be injured deeply in psychological ways that do not appear to be wounds. While the Canadian Army is not perceptibly different from any other national service, they did their staff, cadets, and their families a disservice that summer of 1974 by ignoring if not suppressing news of that event. They can do better.The Army leadership could start by making Fostaty’s recounting of the story required reading. It would be an excellent teaching tool for Army staff and a kernel for discussion. The errors of that day, whether of action, of inaction, or of judgment, do not need to be compounded now by ignoring attempts to come to terms with the event’s effects. Fostaty reconstructs events of that fateful summer in narrative form, using the army’s own investigation results and recounts in dispassionate tones recurrent nightmares over a period of nearly forty years. He was a good soldier then--good enough to teach cadets--and he is a good soldier now. He raises valid points that the Army organization might heed.Errors of this magnitude can be only tragedies if they are ignored or repeated, but if they improve performance or change poor management, they can also be stepping stones to betterment. It is time now to look hard at events that summer, to celebrate the lives of staff and cadets killed or injured on duty in peacetime, and to move forward as better soldiers, in a better organization. Some tragedies become part of the national consciousness and some fade away given time and it's not always clear why. 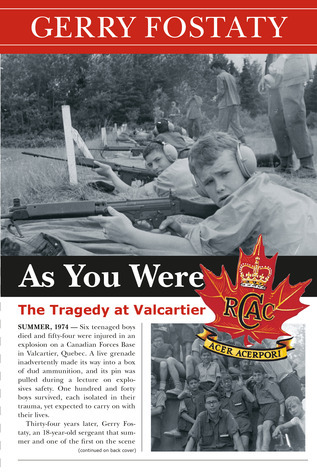 I have to admit that before I read this book I'd never heard of the Valcartier Tragedy. I asked around, but no one else had heard of it either. After reading this book I find that both surprising and unsurprising. Given the horrible nature of the tragedy and the fact that most of the wounded and all of the dead were teenagers, one would think that it would be a famous event. Yet, this was the 1970's and it happened within a military culture that could lock down information in a way that a civilian situation wouldn't be able to so perhaps it's less astonishing that it was made quiet. Fostaty's work puts the reader vividly in his shoes during his cadet days and during the event itself. A significant portion of the book is spent on describing cadet life, but I think without that the average person could not understand the reactions of those present. I think that more Canadians should know this story. I would recommend this book to anyone interested in the military, its history, or in Canadian history. This is a copy & paste of my Amazon review.This story is a tragedy, filled with genuine pain and heroism. It's the story of ordinary people in an extraordinary situation and the political maneuvering that followed.Gerry tells the story with the aim of telling the truth, without ever laying blame. He leaves room for the reader to reach their own conclusions. He highlights the good and the bad, sharing his emotions and experiences in such a way as to make you feel like you were there with him at Valcartier, in 1974.If you only read one book this year, make it this one. It has everything, history, tragedy, heroism, intrigue and Gerry' s writing keeps you involved and interested.This is not a paid review but I do consider Gerry to be a friend and I'm proud that he asked me to read and review "As You Were".In my opinion it's the best book I have read this year. It's certainly the most interesting true life story I've read in years. This novel is one mans memories of a day turned horrific in a little known incident involving the Royal Canadian Army Cadets. In the Summer of 1974 on the Canadian Forces Base Valcartier, Quebec, a live grenade that had made its way into a safety lecture on explosives had its pin pulled. The resulting explosion killed six cadets, injured fifty-four others, and left one hundred and forty other teenage boys isolated; abandoned and ignored by the Canadian Forces and the Department of National Defence. Gerry Fostaty, a Sergeant at the time, recounts his story and the role that he played in the only full account of the events that took place that day and in the days that followed. This novel also follows Fostaty later in life, and discusses the lasting effects that the events that fateful summer in 1974 had on him. I got this book for my birthday a few years ago. It took me a few days to read it as I had to keep putting the book down from crying so much. It was a very well written book on the events that happened. I do recommend this book to anyone working with youth to realize how quickly accidents can happen.